How investors should think about investing in the truck maker and its peers in 2017. In a salutary reminder that stock prices don't always move in tandem with current market conditions, stocks in the trucking industry soared in 2016. The standout performer was Navistar International Corporation (NYSE:NAV): its stock price positively decoupled from an already surging peer group following the announcement of an alliance with Volkswagen. As I write, Navistar stock is up more than 250% year to date. The question now is what to expect from 2017. U.S. Heavy Truck Sales data by YCharts. 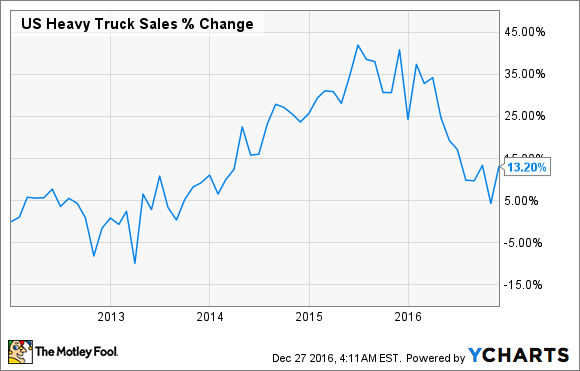 It appears the market saw in 2015 the signs of deteriorating 2016 truck markets, and quickly priced them in. Moving into 2016, valuations got low enough to tempt buyers into buying cheap stocks in what they hoped was a cyclical low. Of course, it didn't quite work out like that, and conditions in North America worsened as the year progressed. For example, Cummins Inc. (NYSE:CMI), a maker of truck engines, parts and components, started the year forecasting NAFTA heavy-duty truck production (Class 8, Group 2) of 220,000 units in 2016, only to lower it to 200,000 units at the time of its third-quarter results. Although Cummins's forecast for the key China market for heavy and medium truck sales actually improved from 720,000 units to 870,000 units, it wasn't enough to stop the company guiding toward the low end of its original full-year total sales guidance range, for a decline of 5% to 9%. No matter: The market kept buying the sector, and in particular kept buying Navistar stock. NAVISTAR OFFERS A RANGE OF VEHICLES AND ENGINES. IMAGE SOURCE: NAVISTAR INTERNATIONAL CORPORATION. Collaboration with Volkswagen on technology and procurement is expected to generate $200 million in annual run-rate synergies by the fifth year; for reference, Navistar's fiscal 2016 sales were $8.1 billion. Using the German company's engines in Navistar's trucks will create a wider range of options for customers and reduce "cost per product platform," according to CEO Troy Clarke. In addition, Navistar has launched new products in (heavy-duty) Class 8 trucks and premium vocational vehicles, and introduced new powertrain options for various vehicles. Meanwhile, management claims it has steadied the ship, and maintained share in its core markets at 16% in 2016. Moreover, the new products helped Navistar increase its combined Class 8 retail market share to 13% in the fourth quarter, compared to 12% in the same period last year. Navistar is back on track. The strong bounce in 2016 means the sector is not notably undervalued right now, even if 2017 turns out to be the trough. Forecasts for the North America trucking market indicate negative to flat conditions for 2017. The chart below outlines the ratio of enterprise value to EBITDA for Navistar, Cummins, and PACCAR Inc. (NASDAQ:PCAR), a truck and engine maker that competes with both companies. 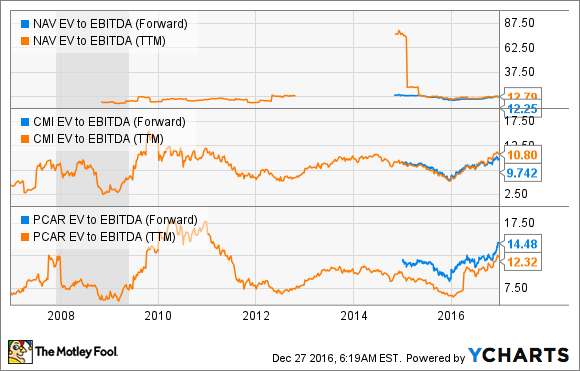 NAV EV to EBITDA (Forward) data by YCharts. Meritor, Inc. (NYSE:MTOR), a supplier of axle, brake, and suspension components, forecasts heavy-duty Class 8 truck production in the range of 190,000 to 210,000 for its fiscal year to September 2017, compared to 253,000 in fiscal 2016. Meanwhile, Navistar's recent end market guidance calls for its core-markets industry production in 2017 to fall to a range of 305,000 to 335,000 units, from 346,500 in 2016. Other industry forecasters are calling for North American Class 8 production to be roughly flat before increasing to double digits in 2018. IMAGE SOURCE: NAVISTAR INTERNATIONAL CORPORATION. With the strong rise in 2016 out of the way, fortunes for Navistar and trucking stocks in general are likely to be dictated by U.S. industrial production and concomitant freight growth in 2017 and beyond. If freight picks up, then demand for trucks will go up, and the trucking sector will do well, as estimates for truck production will probably increase. All told, if you are confident that a Donald Trump presidency can spur U.S. GDP in 2017, and that China can avoid a hard landing, then trucking stocks will be attractive. If not, then they are best left alone. In other words, the sector has gone from being a bombed-out value opportunity to becoming a cyclical growth story.